This is a semi-free build. It never expires, and core functions such as ProBalance, default priorities, and default affinities work indefinitely. With this semi-free edition, you may have to tolerate some non-intrusive nags, and advanced features may be disabled over time. We would like to thank our loyal supporters of Process Lasso. As some may have noticed, we have been very active in 2014-2015. Some new things: Gaming Mode 2.0, ParkControl 2.0, SmartTrim, ProBalance Insights, and lots of general product refinement... just to name a few. If you've tried Process Lasso in the past, but it wasn't for you at the time - give it a new try. We think you'll be pleased, and welcome your feedback! It's as applicable for new PCs as it is old - if not MORE SO. We've got even more coming down the pipe, so hope you'll join us as we make a difference in the world of PCs. And, as always, Bitsum *never* uses installer bundles. That is why we do have to charge for a PRO version of the software, but we believe that's far preferable to ruining the integrity of your PC by tricking you into installing crap via deceitful installer bundles. DISCLAIMER: I am the author. My rating does not affect the overall product score here (I don't think). It's hard for me to give my own software less than 5/5 stars ;). I recently upgraded one of the PC's I have PL on to a latest chip with 16 GIG of DDR3 memory, I was thinking PL probably wouldn't be needed but after some experimentation I found it's still useful esp. for example when transferring multiple & large amounts of files onto external drives or over a network - PL keeps everything running smoothly & I really missed it when it wasn't installed - A worthy 5 stars - Use the 64 Bit version with 64 bit Windows. Makes quite a difference even on fast PC's - Well worth buying the full edition. One small annoyance is on boot the entire UI screen flashes up for a second or so, but the program works OK though. Well worth buying esp. the family edition for 5PC's ($34.95 = £21 to me) which I'm going to invest in - It does make a difference even on a fast PC. @jcollake - My review below was OTT - Sorry about that, it didn't come out the way I meant it - The point I was trying to make was just if you like Process Lasso buy it you won't regret the purchase & it's not expensive. I use Process Lasso Pro (purchased a few mos. ago) & used the regular version for a long time prior to that. 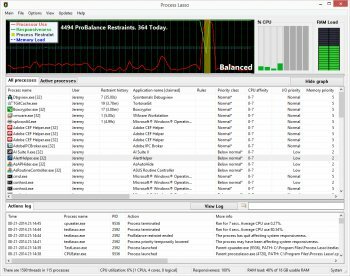 I run WinVista SP2 on a Dell Duo-core computer & Process Lasso Pro does a good job for me without problems. I have ran almost every version of process Lasso since I began using it (alphas, betas, etc.) without problems & the program has helped me have a much more pleasant computer experience. My experience has been that Process Lasso does what it says it will do, nothing more or less, without creating problems & I couldn't ask for more than that. Keep up the good work--kudos!! I'll pop by your forum, and say hi. No problems so far with V6, good software though I use the paid edition. I apologize if the below seemed defensive, I just like to make it clear that I try to do my best to walk the fine line between supporting my family and giving my product away as freely as I'm able to. Like I said, that is why it is labelled Shareware. I thank all users who use ANY version of my software, paid or not. It is an honor for me and my small company. @Music4Ever, that is why I clearly label it Shareware here and at other download sites. SHAREWARE. Even though it NEVER EXPIRES, I get your argument, which is why I DO NOT put it in the FREEWARE category ... This cost me lots of exposure, but it is fair enough. I would also like to add that Bitsum does NOT use deceptive bundles in its installers, FWIW. How annoying are the 'nags'? Well, you see ONE when the program starts (usually only at boot). It has NO TIMER. Click right on past. That is ALL. How restrictive are the features? MOST ALL the popular features NEVER EXPIRE, including ProBalance and Default Priorities and CPU Affinities. The full list is disclosed at http://bitsum.com/howfree.php . So, there is no subterfuge, and in this day and age - I think that counts for something. Yes, sometimes you must pay for software. I simply must pay my rent. That's all there is to it. I'd rather be up front and honest, than tricky and deceitful. Nag-Ware unless you buy it then it's updated often & good, not worth the grief it gives you as so called free-ware which it's not. It is well worth buying though but as this is the free edition 2 stars, if you buy it 5 stars. Either buy it or don't bother. Sorry but they do annoy, either do a demo & release it as a commercial demo or cripple it as true free-ware & yes I am one of your customers. Keeps on improving, well worth buying even for a mulitcore CPU with heaps of RAM. great program. It was noticeable by it's absence when I accidentally removed it in services last week.